These are a box office hit! And no, we don't mean the movies. 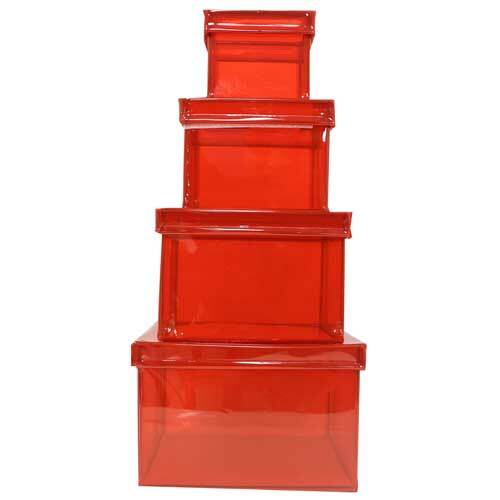 Put these red boxes on your office desk and you're sure to be a hit. The four boxes coming in sizes small to extra large will give you enough storage for all of your office desk needs. From office documents to pens to notepads and more, these red boxes will give your desk some added style. Or use these boxes for a cute alternative to wrapping paper. Attach them all with a cute ribbon (one of ours of course) and you'll have the most unique wrapping in the market. The translucent vinyl material gives each box a slight stretch to the touch, which makes these boxes feel truly different. And the red color gives that passion you always desire to portray. Don’t go without some cute storage for your office desk! Get a set today!